Today Amarone della Valpolicella is unanimously considered to be the most prestigious wine of the Verona area and one of the most important Italian big reds. The Amarone has received similar recognition and appreciation by wine experts and consumers as the other famous Italian reds, such as the Barbaresco, Barolo and Brunello wines. Amarone della Valpolicella is made like the other "red brothers" in Valpolicella using the Corvina, Rondinella and Molinara grapes. The origin of its name comes from the Italian word amaro "bitter" (Amarone means big bitter), in contrast to the sweet Valpolicella wine Recioto. 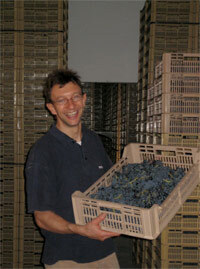 Grapes used for the Amarone must be perfect without any bruises. The grape selection process is done by hand and requires experience and a careful eye. After picking, the grapes are taken into large fruit-drying rooms called "fruttai" and are dried on racks for at least four months. This process reduces the amount of water in the grapes and thus increases the sugar content, producing a more concentrated wine from the same grapes. During the drying process meticulous attention and constant control of the grapes is needed to avoid any mould developing. Some producers still use old racks made of reeds piled in old garrets. Reeds have a better humidity absorption. Other producers prefer to use modern wooden or plastic boxes which can be filled directly in the vineyards, thus avoiding excessive handling of the grapes. They can then be easily brought into modern drying centers where temperature and humidity are carefully controlled. 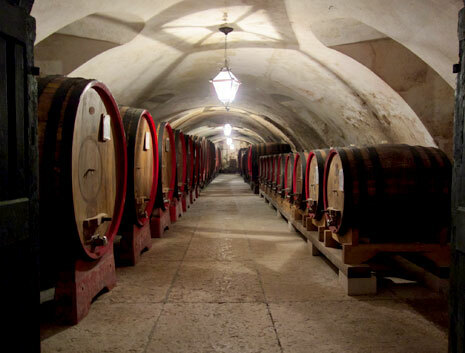 Nowadays the wine estates have revolutionized production by building a temperature - and humidity - controlled building to prevent the grapes from being damaged by mould. The pressing of the dried grapes takes place in winter, around January. Due to the cold temperature the fermentation process is very slow but is brought to completion, raising the alcohol level above 15% (the legal minimum is 14%). 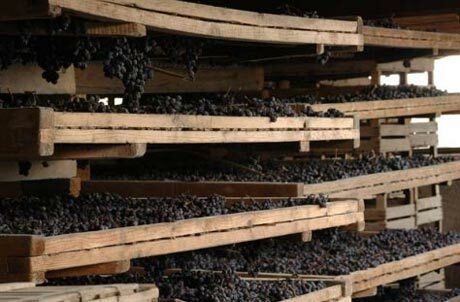 After fermentation the young Amarone is aged for at least three years or more in French or Slovenian oak barrels for the 'appassimento' (ageing) before being put into bottles. The bottles are then laid horizontally in cellars for a year or more. The Amarone wine is aged for a long time. The more successful ones are at their best somewhere between 15 and 20 years. The final result is a very ripe, raisiny, full-bodied wine with an intense ruby colour that with aging becomes 'granato'. The origins of the name Amarone first appear in 1936 in the winery of Villa Mosconi (now Bertani) in Villa Novare. Legend has it that the Amarone was born by accident. It is said that one day the Recioto was forgotten in some oak barrels and fermented longer than usual, which transformed all the sugar into alcohol, thus producing a dry wine which during that period had become too bitter, or "Amaro" as we say in Italian. The history of Amarone follows the skillful development of winemakers from the Valpolicella region who were able to refine production methods without altering the artisan tradition, which characterizes the quality of its production. The first bottle of wine having Amarone on the label dates back to 1940 and is conserved at the Cantina Sociale of Negrar. However, it was called Recioto di Amarone. After World War II prestigious wineries in the area began to export their finest products (Recioto and Amarone) throughout the entire world. In terms of gastronomy, Amarone goes perfectly with grilled dishes, game, roasted or braised meat, roast lamb or goat, with tasty and mature cheeses, or with traditional Veronese culinary recipes such as brasato (roasted meat). For optimum results it is advisable to drink the wine in large balloon - or tulip- shaped crystal glasses. I like to drink it alone in front of a fire with a good book, or in pleasant company.